Tim Bayes, the man behind Schuster, first appeared during the heyday of cassette culture with IBF (Ideas Beyond Filth) and Schuster, later on appearing in the original line-up of Dieter Müh. Relocating to Australia he went underground before reviving Schuster in 2010 with a number of short-run CD-Rs which was followed by their first proper CD release, Blac Flies Resplendent On The Blak Moon the following year. The Circle of Angst is the first release from Schuster since their return to the UK. Shorn of the sampled voices and rhythmic beats, the bleak industrial ambience of The Circle of Angst is, when compared to the preceding Blac Flies..., a far more minimal outing. That minimalism is carried over to the song titles which are reduced to numbers. Opening and closing with appealing sombre piano notes 1.4 slips into a blackened industrial drone which journeys from barren wastelands to submerged aquatic textures, riddled with windswept and storm ridden landscapes. The entire track sets the tone for this release. 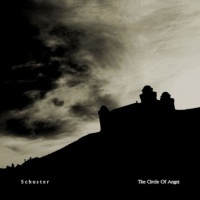 It seems on The Circle of Angst, Schuster are intent on creating atmosphere through manipulated droning and field recordings. At points, it seems that The Circle of Angst is drawing upon earlier Schuster releases. The rippling water effects that appear throughout the four tracks of The Circle of Angst are - to my ears at least - reminiscent of the sound sources that drenched 'Submerge (Drawing Down The Moon)' from Blac Flies... . Here though, deftly manipulated and mixed with drones, they are taken into new realms of bleakness. 2.4 builds from a series of reverberating hollow thuds with a quiet drone carrying traces of slowed down hymnlike chants, with ghostly shudders. Pensive airy melodic keyboards swell into a barrage of pounding drums and battle cries before cutting to dripping piano notes. 3.4 is based around a wavering drone cut with distant conversational voices that are treated then chopped and looped into churning growling tones, with additional manipulated sound sources. 3.4 segues into 4.4 adding abrasive rumbling sounds and aquatic textures. The entire thing seems to comprise manipulations from the preceding tracks, albeit in a more minimal fashion. Just as the churning drone that underpins most of this dissipates into silence, all that's left is the dank undertow of rippling aquatic textures arriving in waves. And then the melodic piano notes reappear before the circle begins again.